1040-2 Temporarily out of stock. Call for more information. An important factor in making an easy running and reliable highway car is a ball-bearing rear axle. In the regular Ford construction, the load is transmitted from the housings through the roller bearings to the shaft and to the wheel hub. This causes severe bending strains in the axle shaft. The ball bearings replace the outer roller bearings, but with the radical difference that the ball-bearings transmit the weight of the car directly from the axle housing through the ball-bearings to the rear wheels. In the ball bearing construction, the axle shafts carry only the driving and braking effects and are only subjected to twisting strains. 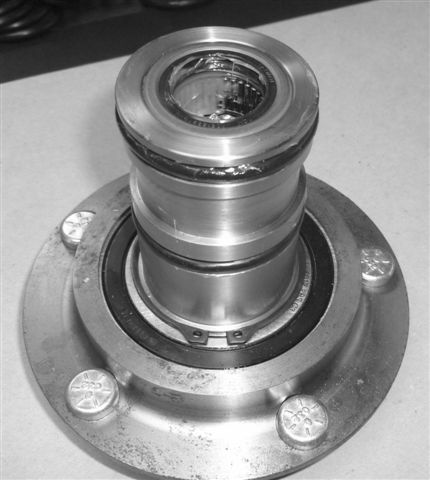 When using the standard Hyatt bearings, axle shafts have twisting strains and severe bending strains due to the loading and bouncing of the car. The bending strains are responsible for the grooves that develop on the axle with the regular Ford construction. You will receive Two Type 3 Floating Rear Hubs. .
You will receive Two Type 3 Floating Rear Hubs.